The Swirle Pavilion on the Quayside, Newcastle. Location: Quayside, Newcastle. Materials: Ashlar, Concrete and Metal. The Swirle Pavilion is part of the Newcastle and Gateshead 'Art on the Riverside' Project. 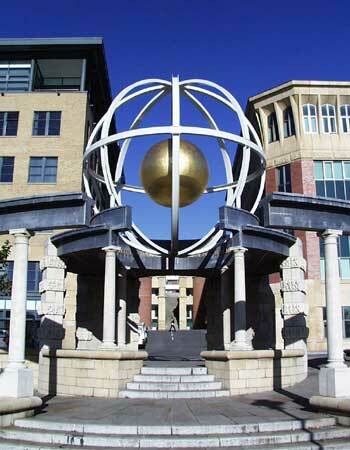 Below the globe are inscribed all of the European ports that were regularly visited by shipping from the Tyne. Hamburg, Genoa, Aberdeen, Rotterdam, Copenhagen, Malmo, London, Antwerp and Hull.